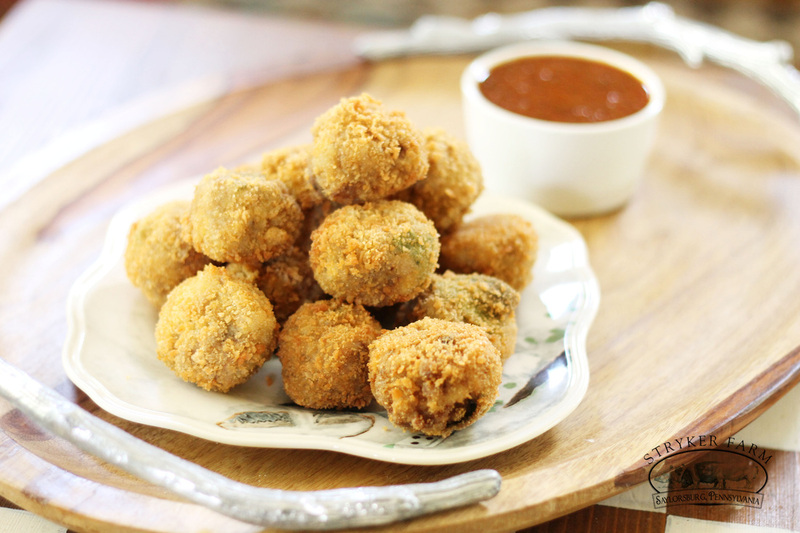 This tasty appetizer was modified from a Bon Appetit recipe. 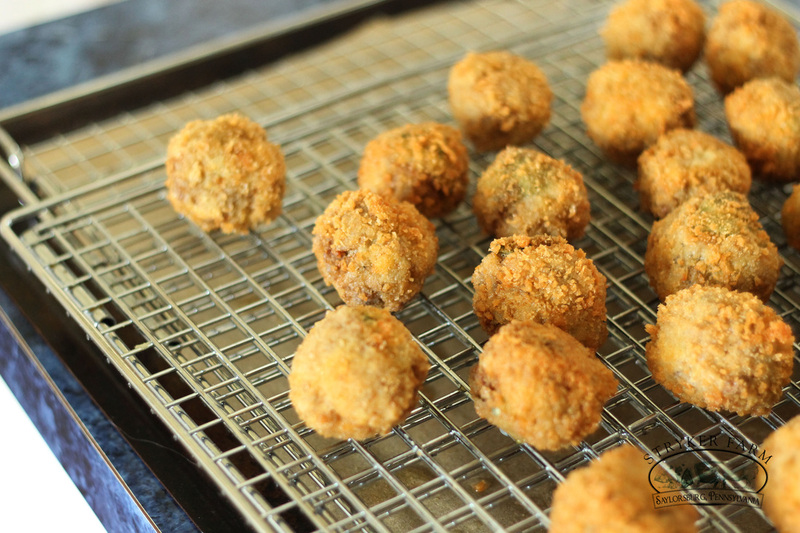 Although these little pork meatballs are fried, they can be made up in advance, frozen, and easily heated in the oven to be served for no mess entertaining! 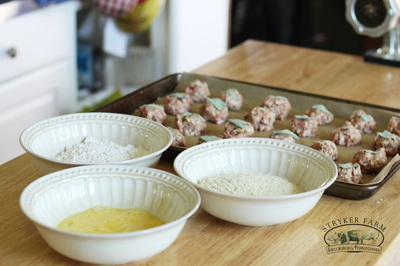 Prep a baking sheet with parchment. 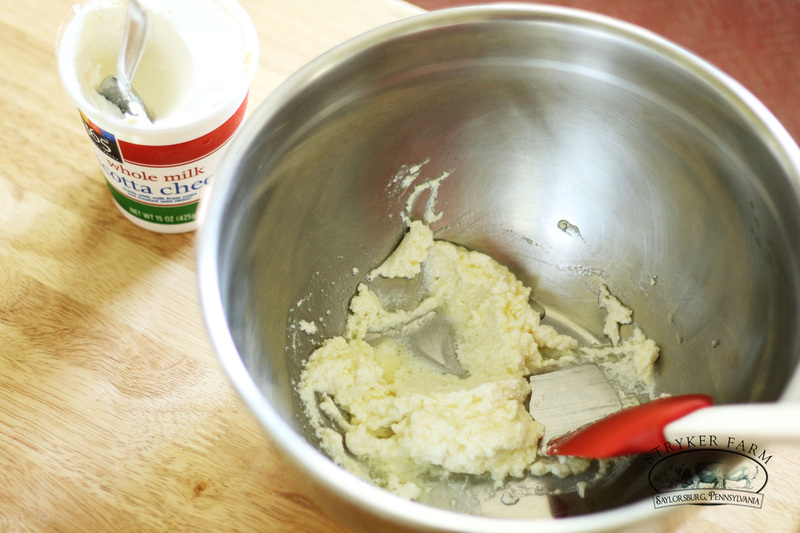 In a large bowl, mix the ricotta and 2 tablespoons of oil (vegetable or olive). 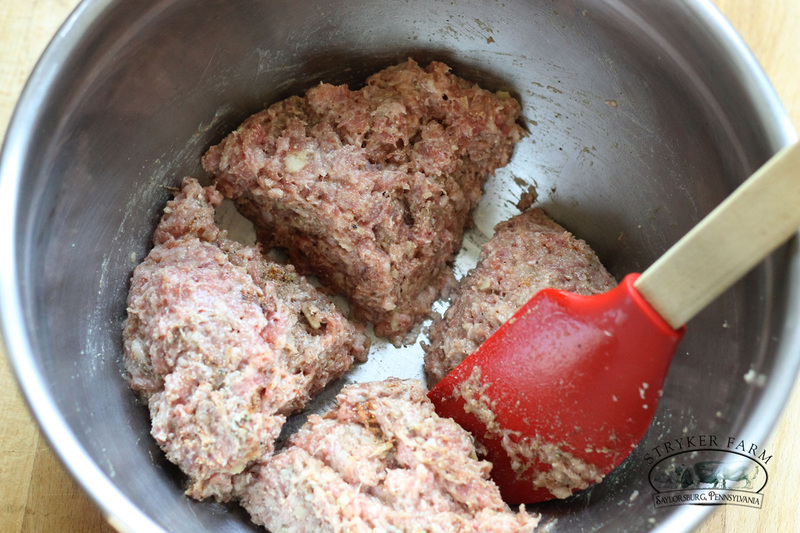 Stir together, then add the raw ground pork. Using a spatula, fold in the pork to the ricotta mixture. Next mix in the garlic and the dried spices. The red pepper makes these a bit spicy. If you’re not a fan of spice, don’t omit it altogether, just use half. Divide the mixture into 4 sections. 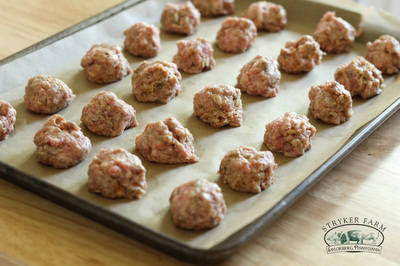 This makes it easier to divide into 24 meatballs much easier. Use a spoon to scoop out bite-sized bits of the pork, about an inch in diameter. Roll into balls with your hands and arrange on the baking sheet. Next wrap a sage leaf around each of the balls. If they don’t want to stay, press them gently into the meatball. The sage leafs are a bit fussy, but they add a distinct flavor to the final product. 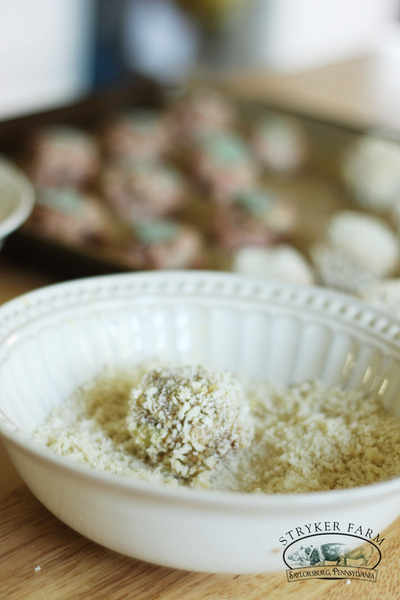 Prep separate bowls of flour, whisked egg and the panko crumbs. In an assembly line style, dredge the balls through the flour, egg, and panko crumbs. Work one at a time, taking care to shake off excess of each. (Having a helper for this stage is handy). 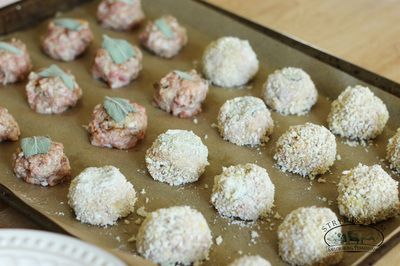 After the bread crumbs, lightly roll the meatball in your palms to press everything together. Return them to the baking sheet. Hint: This is a good time to clean up your work space. Now prep for frying. Attach a deep fry thermometer, or a candy thermometer to the side of a large heavy pot. Pour in 2 inches of oil. This should be enough to totally submerge the meatballs. 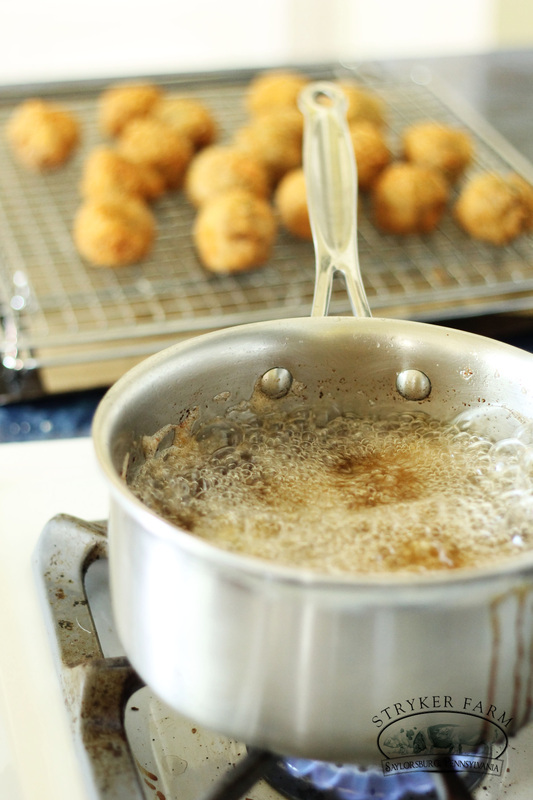 On medium high heat, gently raise the temperature of the oil to 350°. 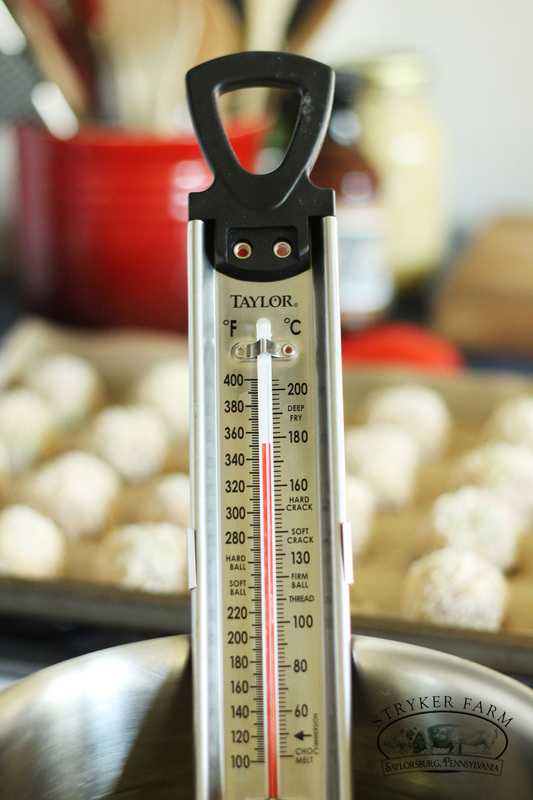 A candy thermometer is helpful for an accurate reading. Wear an apron throughout this process, it can get messy! Also turn on any ventilation that you might have. If not, I suggest opening a window or two. While the oil is heating, prep a second baking sheet with parchment and place a wire drying rack inside. When the oil is up to temperature, be ready to work quickly. Use a pair of tongs to transfer a few meatballs at a time to the oil.They require constant attention, turning as to evenly fry. When they are a light golden brown, use a slotted spoon to take them out and place on the wire rack to drip and cool. At this point you could serve them OR after they are completely cooled, you can stack in an airtight container and store in the freezer for up to a month. 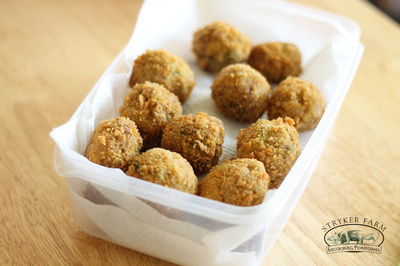 Again, these are fantastic for entertaining. 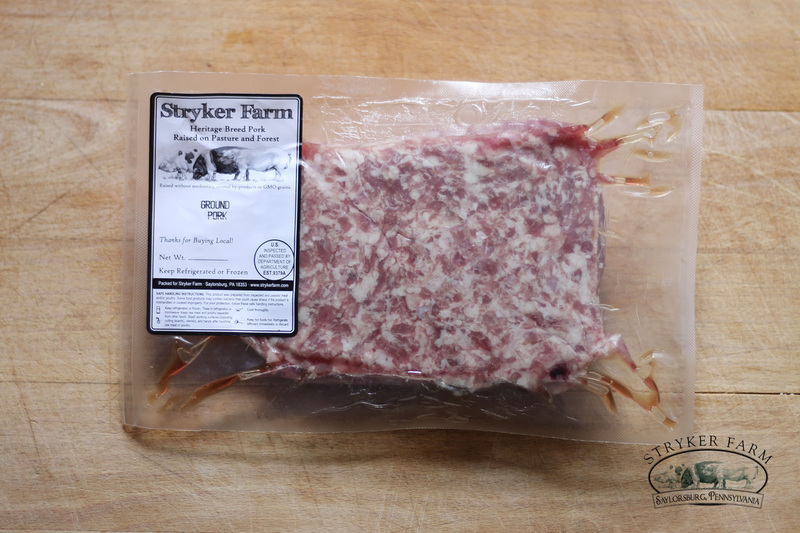 When you are ready to reheat them, bake from frozen in a preheated oven at 275° for about 15 minutes. 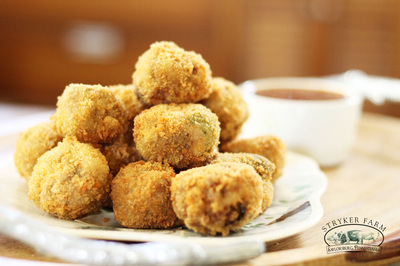 Serve with some warm marinara dipping sauce.